Walter George Giles was born in Quorn in 1888. He was one of six children of George and Elizabeth Giles, although only three survived to adulthood. He worked as a carrier, often for Facers in the village. His grandson Christopher Causton tells how at Wrights factory, they once presented him with a large cardboard medal, when he kept them supplied with coal during a period snow! During WW1 Walter was a signaller and fought in the Gallipoli campaign. 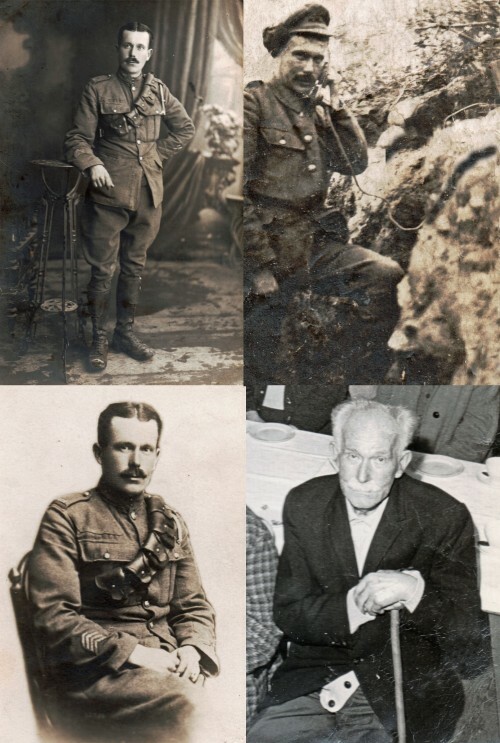 The first three photographs show Walter in his army uniform during the war. The first picture was taken in Bulgaria. The second shows him in the trenches. The fourth photograph was taken in either the late 1960s or early 1970s when Walter was at an Old People’s Fellowship event. In his later life Walter lived with his daughter and her family on Unitt Road. Giles Close off Selvester Drive, which is at the back of Unitt Road, is named after Walter and the Giles family.